This blunder occurs way too often. You listen to bad information from others who tell you’ve got to have a BIG bathroom to make a walk-in shower work. This simply isn’t the case. In reality you can have a walk-in shower in the tiniest bathrooms, IF you’re willing to have a 100% open design without any doors. Since, in the United States at least, this isn’t what most people want, I went on to tell Lisa we often supply walk in showers which were converted from tub spaces. These spaces are 60” wide x 32” to 34” deep. 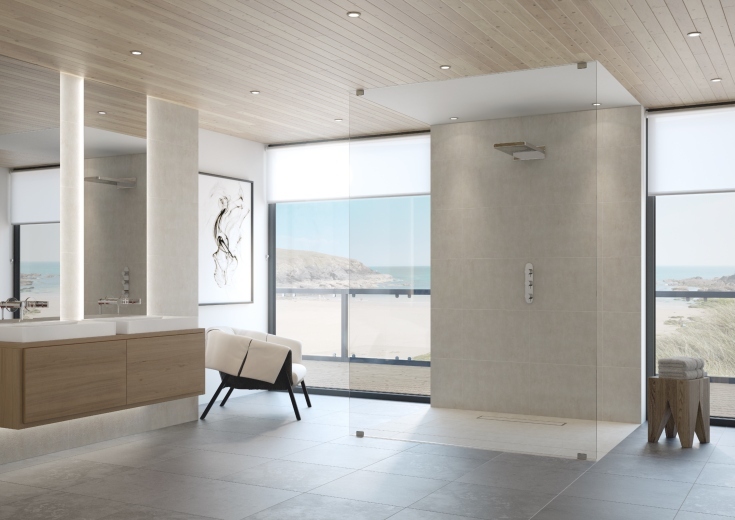 If you use a shower screen or a curved (thinner sized) glass block shower wall you can take out your tub, still have glass keeping you warm and also enjoy a doorless shower. Blunder #2 – You use the wrong shower head, place it in the wrong spot, and water gushes out. The type of shower head is very (or very, very as Trump would say) important in a walk-in shower. It doesn’t take an engineer to figure out if you use a stationary shower head directed at the opening of a walk-in shower, you’re going to get water on the bathroom floor. If you’re designing a small walk in shower, I’d recommend using a rain head which is, by design, directed down at your head (not blasting full-force at your body). It will reduce the chance of water flowing out onto the bathroom floor. For some people right after they have installed a beautiful clear-glass walk in shower they stand back and think…it’s perfect. It’s perfect …until their husband comes in and wants to have a conversation when they were hoping and praying for a few minutes of privacy in the shower. 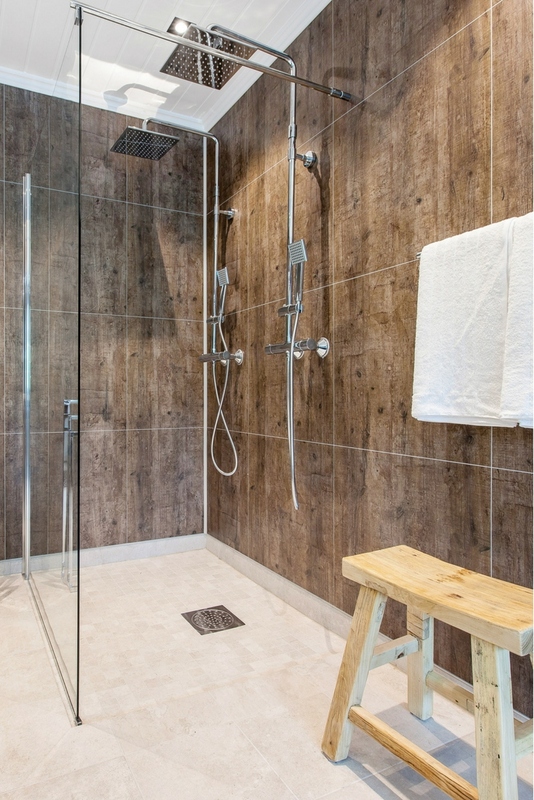 A walk-in shower doesn’t have to ‘put you on display’ for everyone in your family who wants your attention RIGHT NOW! 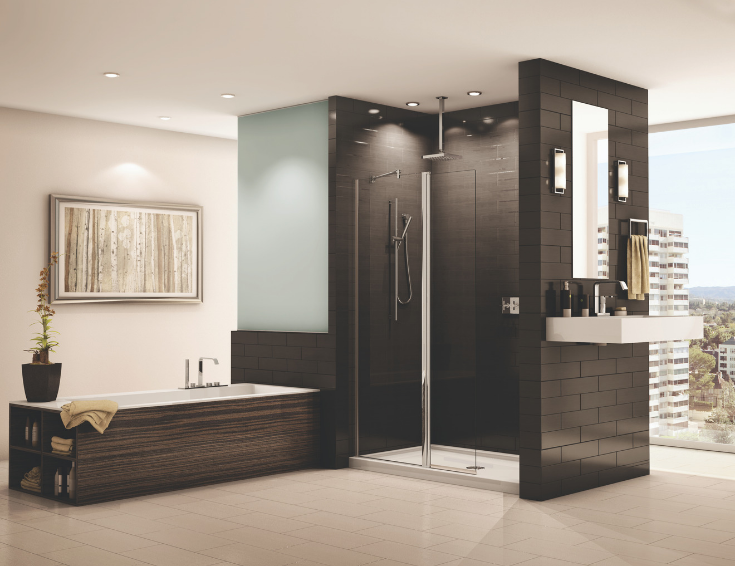 You need to design a smarter walk in shower which gives you the personal space (and showering privacy) you crave. Instead of going with clear glass with a big opening – size it down with a shower screen (mentioned in blunder #1) with a twist. Use obscure glass vs. clear glass. Another strategy is to use an obscure wave pattern of glass blocks for your wall. It can create a private, yet open, shower for you. Nobody wants puddles on their bathroom floor which reminds you of the ones you jump over because of uneven asphalt in your work parking lot. When one level shower and bathroom floors aren’t leveled right this is exactly what can happen in your bathroom also. An even bigger concern with pooling water is if it leaks onto the floor (or God-forbid) furniture below. That can be a disaster! There is a simple solution to eliminate this problem. Make sure your shower base (or shower floor) has been built with a system (not done by hand by some dude who could be having a bad day) which is pre-sloped and waterproofed. Here’s two ways to make this happen. 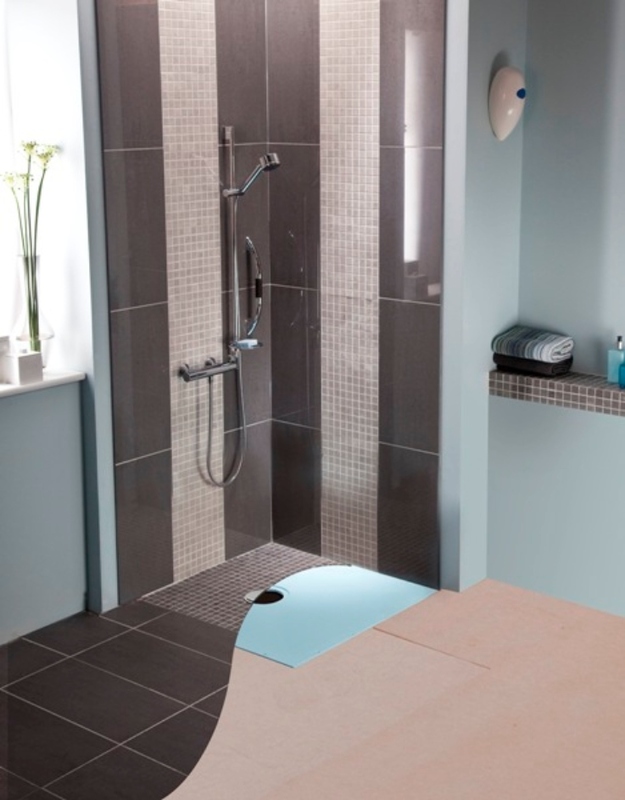 First, if you want a ‘flat’ (or one level shower and bathroom floor) use a shower base former and waterproofing kit. These kits not only waterproof the shower, but the bathroom floor as well. 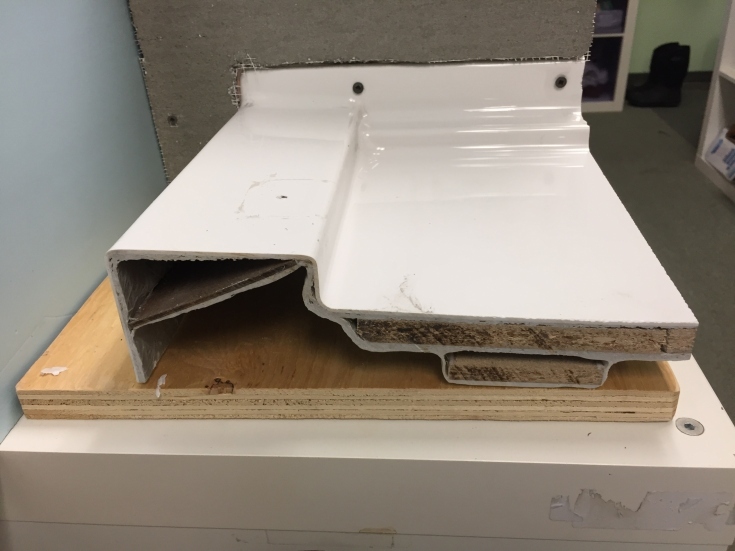 Second, if you want to use a low-profile shower pan (and just slope the shower area), don’t pick up the cheapest one you find at a big-box store. 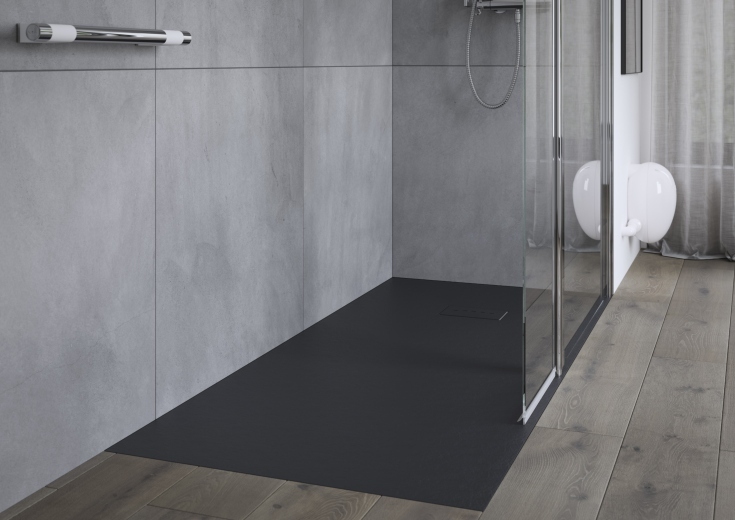 One nicer option is a reinforced acrylic shower pan – also known as a ‘Flexpan.’ The bottom of this acrylic pan is built on sturdy MDF sub core, so it won’t bend when you’re walking on it, or crack down the road. Tile showers are beautiful the day they’re installed. 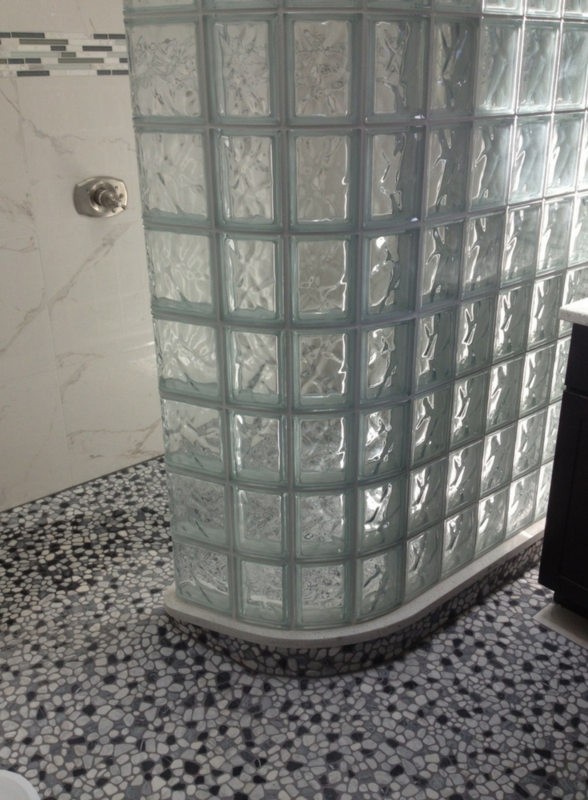 Tile showers don’t stay beautiful as you and your family use them. Dirt, grime and mold become their middle names. Cleaning tile showers is enough to make you want to pull your hair out. It’s disgusting. You’ve got better things to do with your life. You KNOW you don’t want a walk-in shower if you’ll become a slave to cleaning tiny grout joints. Here’s 2 ideas to work-around this dilemma. Idea #1 – Use a linear drain. Linear drains allow you to use large format tiles. While they don’t blow up joints all together, they cut them down to a manageable size. The good thing about a full glass enclosure is it keeps the water and steam enclosed. You stay toasty warm (especially if you have the hot water turned up full blast). That’s how I like it. 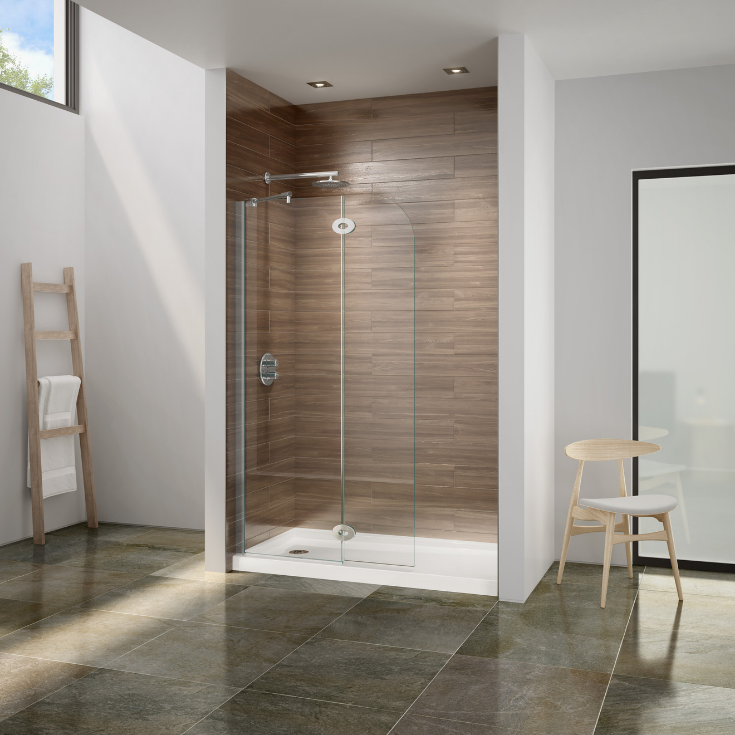 A walk-in shower, by the nature of its design, has an openness a full shower enclosure does not. This openness allows heat to escape. The question becomes, how can you have the ‘best-of-both-worlds,’ an open design and a warm shower? Here’s a couple of ways to get these 2 benefits. First, add a heated floor. They’ll keep you warm (even in the harsh, cruel winters those of us in the Midwest and East are hoping are done once and for all this year). Second, you can go ‘half-way’ with your open shower system. Incorporate a pivoting shower screen, which takes up half the opening. It keeps more steam inside. It’s truly a best of both worlds’ idea. Since most walk-in showers aren’t an ‘out-of-the-box’ rectangular unit you can grab at the big-box store, most people assume their custom design requires using high maintenance grouted tiles for a luxury look. 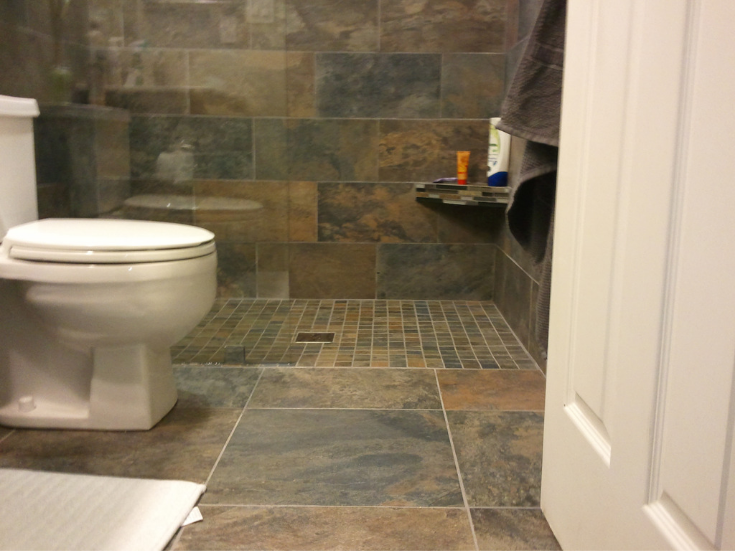 If you want a custom tile or stone look (and the ability to chuck your poor, unwanted tile scrub brush) there is a no-hassle option for you. This option is laminated shower wall panels. These 2’ x 8’ x 3/8” units click, lock and seal together. You get low maintenance. You win the battle over the scrub brush. If you want your wall to pop (without your knee-joints popping from scrubbing tile) a fun option is bright high gloss wall panels. These 39” x 96” and 60” x 96” panels are fun, shiny and add pop and excitement to your bathroom or shower walls. They’re also simple to cut. These digitally printed, ¼” thick panels give you the classic look of marble and stone with a super-simple installation process. 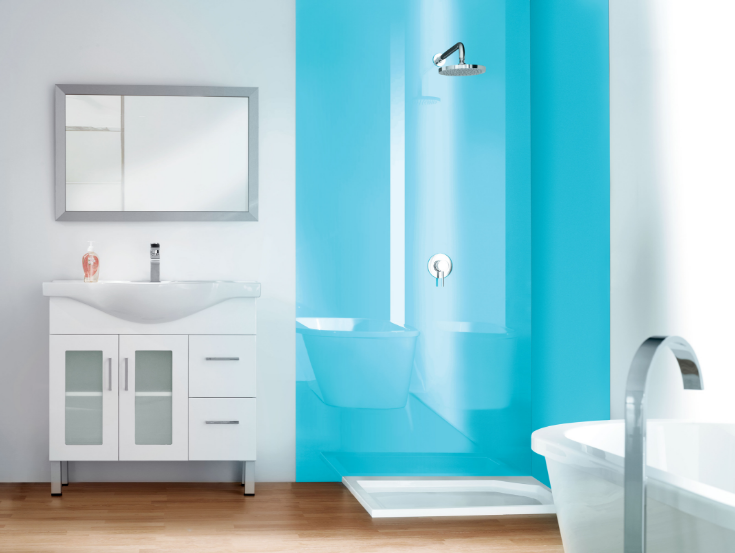 Your friends and neighbors will THINK you spent big-bucks on your shower. It can be your little secret you didn’t (and it was simple to install it yourself). 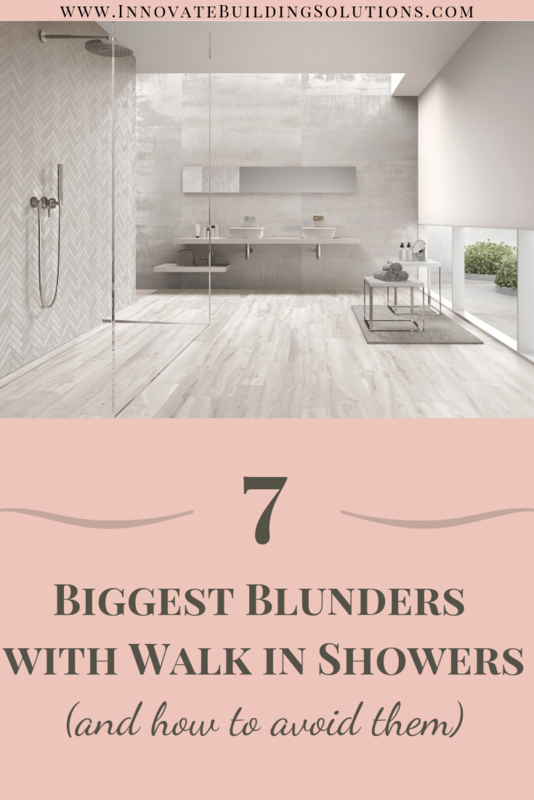 So now that you’ve read the 7 biggest blunders of walk in showers (and how to avoid them) are you ready to push ahead despite the FEARS (False Evidence Appearing Real) from the ‘Mr./Mrs. Doubt-Fires’ in your life who wanted to cool your passion for a walk-in shower? 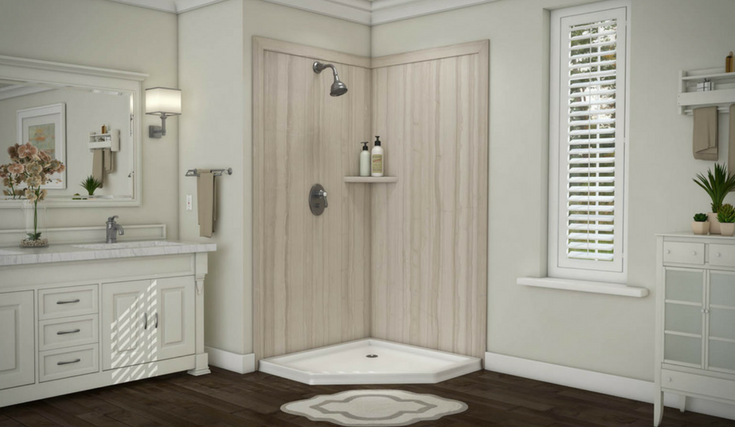 Do you have any specific questions about a walk-in shower for your home you want advice on? If so, call me (or a member of my team) to get technical advice and factory-direct pricing on one level wet room systems, glass walk in showers, or curved glass block walls. We’re looking forward to helping you. For more information about a walk-in shower product contact Innovate Building Solutions at 877-668-5888. For a local remodeling project call Cleveland Design and Remodeling at 216-658-1270 or in Columbus The Bath Doctor at 614-252-7294. If you’re in the building business, click here if you’d like to learn how to become a shower wall panel dealer of the laminated wall panels mentioned above or call and ask for Mike at 877-668-5888. If you want more advice (or like wacky humor) follow me on Twitter @Mike_Foti or my companies @InnovateBuild or @InnovateHomeOrg or connect on LinkedIn @MikeFotiLinkedIn.